I’m hitting the gym soon for a lower body workout sprinkled with some shoulder presses and lat pulldowns. Today is the last day of my 4-week program and since fall is right around the corner, I’m going to look at using sprints into my program (hill sprints would be even BETTER). “The magic happens out of your comfort zone”. And because your feedback has been so great on my facebook page with the sprint and conditioning “hybrids” I’ve been posting, you’re going to LOVE this killer conditioning workout that uses an INSANE combination of using sprint and bodyweight exercise supersets. Yeah, I said those words. Sprints. Bodyweight Exercises. Wowza. 2) You think sprinting is JUST for athletes. And I think that’s why I there is an obesity epidemic here in the US. Look at all the commercials. They are packed full of treadmills and gadgets encouraging you to watch TV while you walk for an hour. Have you ever seen a shredded athlete, no matter what sport, walking on a treadmill for an hour? No, of course not. To LOOK like an athlete, you must TRAIN like one. I’ll show you how to do that today. Sprints are like finishers, but it takes some patience. You see, sprinting is very demanding on both the nervous and muscular systems. So, that’s why you need to rest MORE between sprints so you can really go “all out” on your sprints. 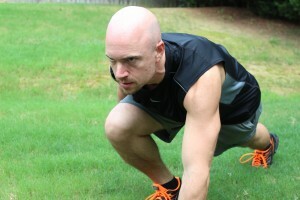 Now before you try this sprint conditioning workout, I recommend using a grass field or better yet… a hill. Hill sprints will keep your hamstring injuries at bay. I would have my clients do this twice and rest for about 30 seconds between circuits. Now you’re ready to melt fat. 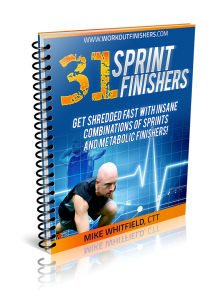 Sprinting can bust through any plateau and of course, help you lose fat faster. When it comes to sprint conditioning workouts, you can do them on your off day as long as you are recovering fine, but you can also plug them in after your main workout. Just know the way I write them – they are longer than typical “finishers”. I’ve also had clients that would replace their main workout with sprint conditioning workouts for a few weeks to give their body a break from lifting weights (and to keep things interesting). Alright, let’s rock this so you can have pancakes this weekend. Do the following superset as many times as possible in 10 minutes, resting only when needed. Once the 10 minutes are up, rest 1 minute and move into the next superset. Do the following superset as many times as possible in 10 minutes, resting only when needed. Once the 10 minutes are up, you’re done! A) When using the density approach (above), I recommend resting after every each superset for 30 secs to 1 minute. This will allow you to recover better (even if you think you can go without the rest). You’ll be able to pace yourself better and get MORE out of your sprints (which leads to a better caloric burn). Do this a total of 6 times. THAT’S how you train like an athlete to look like an athlete. Let the amateurs crowd the treadmills and ellipticals. P.S. Don’t let age be a factor, either. That’s just an excuse to not try sprinting. After all, I’m going to be 40 next year and I’ll be training like an athlete… why can’t you? This sounds like the perfect weekend workout. 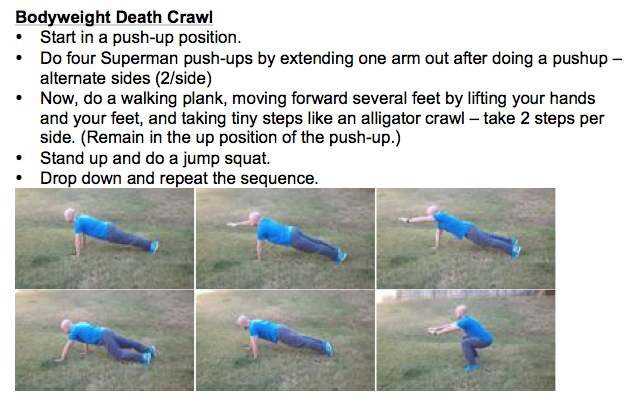 To stand up at the end of the bodyweight death crawl do you walk your hands back to your feet or your feet to your hands? I always bring my feet to my hands. This is a brutal one for sure!